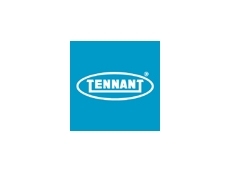 Tradeflex Services Group Pty Ltd has once again partnered with Tennant Company for the supply of commercial and industrial cleaning equipment. 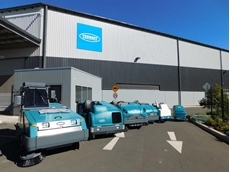 Tennant Company, a leader in designing, manufacturing and marketing solutions that help create a cleaner, safer world, today introduces its S20 Compact Mid-Size Rider Sweeper to the Australia and New Zealand markets. 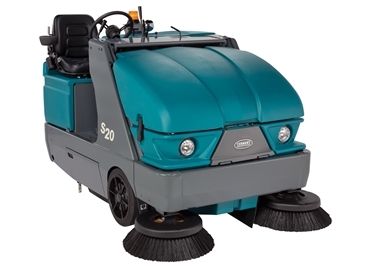 The S20 is an easy-to-use, compact and versatile rider sweeper that offers robust cleaning performance, increased safety, and greater value. “The S20 rider sweeper is the latest customer-driven innovation from Tennant Company, and provides the industry with exactly what it’s been asking for. While the S20 is compact and versatile, it also offers the cleaning power and performance of a larger machine and provides users with improvements in three key areas—air quality, safety and their bottom line. 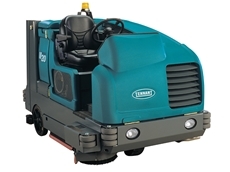 With so much going for it, we anticipate the S20 will set the new standard for industrial-strength compact sweepers,” said Chris Killingstad, president and CEO of the Tennant Company. The S20 Rider Sweeper improves air quality and optimizes cleaning with the SweepMax three-stage dust control system, which removes the majority of dust and moisture from the air flow before it reaches the filter, and the ShakeMax 360 filter shaker, which cleans the filter from the inside out, dislodging dust particles caught deep within the pleats. The sweeper improves operator, employee and environmental safety by offering excellent operator sightlines, a steering wheel-mounted horn, a seat occupancy switch that shuts down the engine within seconds if the operator leaves the seat, and a Thermo-Sentry hopper sensor that alerts the operator to excessive heat in the 11 ft3 /310 L-capacity debris hopper. The S20 also reduces the total cost of ownership for customers by improving productivity and reducing costs. Productivity is improved with easy no-tool access to all routine inspection and maintenance points as well as no-tool dust filter and brush change out. Costs are reduced with a nanofiber canister filter that lasts three to five times longer than a traditional panel filter. 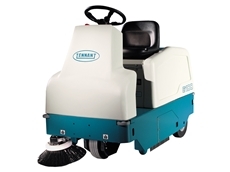 Customers can maximize their productivity and tailor the S20 to their specific application by adding such features to the sweeper as dual side sweeping brushes that deliver a 62- inch/1,575 mm sweeping path, a vacuum wand for cleaning off-aisle and in tight spaces, and steel tower bumpers that protect against accidental contact. For facilities looking to reduce their carbon footprint by moving toward battery-operated equipment, the S20 is also available in a fume-free battery version. According to Killingstad, the S20 is ideal for both indoor and outdoor use and in a variety of applications, including distribution centers and warehouses, parking lots/decks and outdoor spaces, heavy and light manufacturing, food and beverage, foundries, retail and shopping centers, and more.